In the Peruvian rainforest, a mutualistic relationship thrives between Inga tree saplings and native ants. The young trees need the ants as defense, so insects don't eat their leaves. The ants get "paid" for this defensive role using nectar provided by the tree. In this beautiful Ultra-HD video from Deep Look, we see how this relationship works—and how it breaks down when clever Riodinid caterpillars come along! The moral of this story? Never trust ants to protect you. For more discussion, read this KQED article. Also fascinating is this paper by Suzanne Koptur (PDF link) describing the same ecosystem. 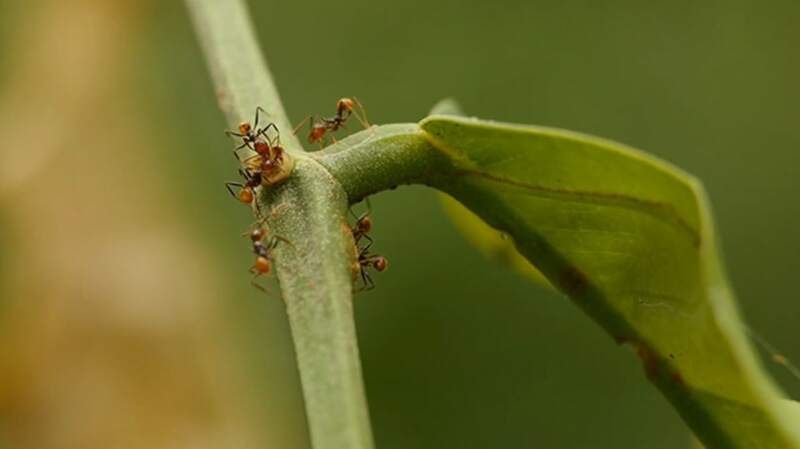 There's also a nice It's Okay To Be Smart video on ant/tree mutualism. And if you enjoyed this, watch another Deep Look video: What Do Ants Do With the Leaves They Carry Around?